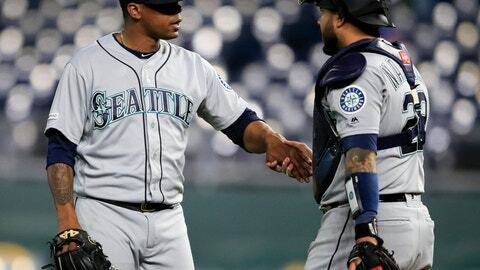 The surprising Mariners have a six-game winning streak and the best record in the majors at 13-2 heading into a home series against AL West favorite Houston. Seattle is the first big league team to homer in each of its first 15 games and only the third club since 1987 to open at least 13-2 after Milwaukee (14-1 in 1987) and Boston (13-2 last year). Seattle’s 36 home runs are tied with the 2000 St. Louis Cardinals for the most in a team’s first 15 games. The Astros also have won six straight and hope to get star third baseman Alex Bregman back from a sore hamstring. Christian Yelich and the Brewers visit Dodger Stadium in a rematch of last year’s NL Championship Series won by Los Angeles in seven games. Julio Urías is scheduled to start against Milwaukee right-hander Corbin Burnes, who earned his first major league win against Los Angeles on July 21 last season. Angels slugger Mike Trout, who strained his right groin Tuesday, hopes to be available for an interleague series this weekend in Chicago. After a 1-6 start, Los Angeles has won six in a row. Tyler Skaggs (1-1, 2.45 ERA) makes his first career appearance at Wrigley Field in a matinee against Cole Hamels (1-0, 5.73) and the 4-8 Cubs. Rookie slugger Pete Alonso looks to keep up his astounding power display when the New York Mets play at Atlanta. Alonso rocketed his latest home run into a terrace fountain far beyond the center field fence Thursday night, a 454-foot laser with a 118 mph exit velocity that splashed into the tank before floating softly on the water. The only players with harder-hit home runs recorded by Statcast are Giancarlo Stanton, Aaron Judge and Mike Trout. Alonso has 17 RBIs, a Mets record through 12 big league games. His 12 extra-base hits are the most by any major league player since 1900 in the first 12 games of a career. The brawny first baseman is batting .378 with six homers, six doubles and a 1.362 OPS. Kansas City tries to stop its 10-game losing streak when the Cleveland Indians come to town. With the poorest record in the big leagues at 2-10, the Royals are off to their worst 12-game start since 2006. “Other teams just can’t seem to do any wrong,” said Whit Merrifield, whose hitting streak ended at 31 games Thursday when he went 0 for 6 against Seattle. Merrifield had not gone hitless since Sept. 9. Royals center fielder Billy Hamilton was carted off late with a knee injury, and the team was awaiting an update on his condition.